The professional steamer with patented breakthrough technology that works 5 times faster than ironing! 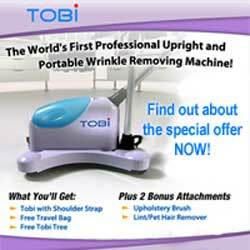 The world’s first professional upright and portable wrinkle-removing machine, that also helps remove unpleasant odors, can be yours today! The first and only professionally powered upright and portable wrinkle removing machine designed to wipe out wrinkles just like the pros at the dry cleaners and in the fashion industry. Helps to remove unpleasant odors so you can stop wasting money at the dry cleaner.